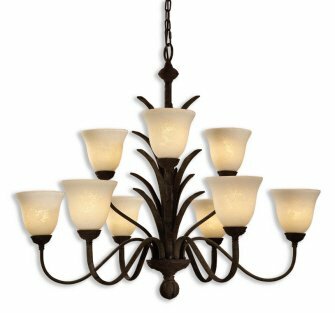 21026 - Uttermost Leena 9-Lt Chandelier. These oversized glass candles and rich rustic patinas mix very well. Rope details give this collection a relaxed and graceful look. Easy to use in todays privileged casual homes. Fixture Type: Chandeliers. Designer: Carolyn Kinder. Number of Lights: 9. Wattage: 60W. Dimensions: 31.5 H (inches).